The Eight of Cups often turns up in a Reading when you have lost interest in something in your life that once held importance for you. Nothing terrible needs to have happened but you just don’t feel the same anymore. You might have changed, grown up, matured or possibly what once captivated you has changed and lost its appeal or fascination. This Card teaches us the lesson of Impermanence and it is often a tough one to accept. We think we know what we want and what will make us happy. We then go out and try to get it. Then we try to hold onto it. We expect things, people, life and situations always to stay the same but it is like trying to hold water in your hands. If nothing changed, the world would be a very boring place and nothing new would happen. Our own personal world would become very small and we would never be exposed to new experiences or people. It is surprising how many people will say they don’t like change but then are the first to say that nothing ever happens. When we lose interest in something or in life, our energy levels drop, emotionally we feel down, psychologically we feel negative and spiritually we feel lost. When you pull the Eight of Cups it is telling you to do something about it. It suggests the possibility of having to leave a job, career, partner, family, home or country to find what you are looking for. If you have lost interest, then let go, say goodbye and move on. It may feel strange at first letting go of something or someone who has been so familiar and it may even feel lonely at times but really it has all become just a habit. Once you kick the habit and wean yourself off the situation then you will begin to come back to life again and doors will open all around you. The Eight of Cups can appear when you realise that something is missing in your life. You may have lost something or someone of dear value to you. You may feel a huge void or emptiness and at a loss as to what to do next, as you are left to carry on alone. 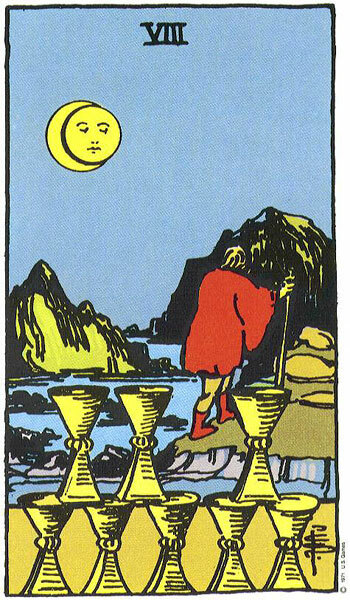 I often get a sense with this Card that the Figure is walking away, alone, from where his loved one has just been laid to rest, the Cups marking the spot where his heart and emotions have been left behind. He will now have to make his own way in life and will experience terrible loneliness. However, the gap left for his Ninth Cup, tells us that he will be able to heal and find happiness again. Once he does, he will return with his Ninth Cup and reclaim what he once thought, gone forever. Then again you may not know exactly what is missing but just know something is. The Eight of Cups very often appears after a time of Soul Searching or as acknowledgment that you are embarking on a Journey of Personal Discovery. You may have recently been taking a good look at your life and viewing it objectively or from a different perspective. This often occurs after a disturbing or upsetting incident or situation and can also be triggered as a result of being let down or betrayed by those you thought close. At other times it can occur upon reaching a milestone birthday and especially after a bereavement. It is the sudden realisation that everything thing in your life up to now is in question. You can no longer take things, people or your happiness for granted anymore. This may be quite disturbing for you. You might feel that you have just drifted through life up until now; asleep most of the time, running on automatic pilot. You may not have given much thought to your own personal happiness or needs. Possibly you have been catering to the needs of others for a long time and just got on with things, happy enough that everyone else was happy. The Eight of Cups, acts as a ‘wake up call’, throwing the spotlight on you and shaking you out of your slumber. Life is slipping by and what have you got to show for yourself? Are you who you want to be? Are you where you want to be? Are you happy? Do feel fulfilled? Is this enough? Do you want more? The Eight of Cups does not want to know of how you have made others happy and how you have catered to their needs. What it wants to know is how you are? How you really are? It does not want you to rush with your answers because it wants you to have a really good think about it. The Eight of Cups knows the answer, it knows the truth of you but there is no use telling you for it must first come from within. This Card appearing in your Reading is letting you know that there are areas of your life you have not yet explored. Your current cycle is over, you have done your time and deep down you know it. It tells you that you may need to start moving in a new direction, one that resonates with you and will help in your personal and spiritual evolution. Regardless of what age you are, you do not really know who your are and what your abilities are. You have barely tapped into your potential. It suggests you now take the time to ‘Find Yourself’ for your journey is far from over. You must now seek for answers and for deeper meaning. It is a time to go beyond the superficiality of all around you and concentrate on what is important. It is there you will find your Personal Truth. The journey and search suggested by the Eight of Cups may happen either externally as in relocating or travel or internally such as meditation, counselling, books, holistic therapies and courses. Much inner and outer work needs to be done. You might feel the need to withdraw from the rat race to focus on what is of true worth and to hear your inner voice. The Eight of Cups does not imply that your Personal Journey will be easy as many superficial and shallow layers will have to be peeled away before you will find your Personal Truth and Spiritual Core. Some layers will shed easily and will be voluntarily discarded but there are others that will cling. These will bring major challenges to overcome and will represent aspects of your personality that do not act in your highest interest. It will also entail you leaving all your emotional baggage behind. You must listen to what your heart and soul truly desires. The Eight of Cups assures that you have the strength to carry it through. Major transformation can occur with the potential for real happiness. Externally, you may seek to change your image to something that feels more like you. You may have been dressing to suit a group, friends, partner or family and now want to explore your own style. You no longer wish to keep up with trends but want to create something more personal. You might also consider changing your hairstyle and even losing weight and toning up. 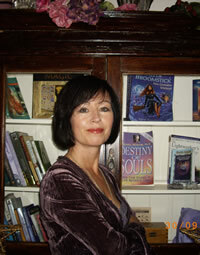 This outward change is all part of the holistic transformation and discovering the Real You. It is time to be your own person both inside and out. When the Eight of Cups appears in a Reading it is letting you know that you have the emotional strength to leave a situation that no longer brings you happiness or emotional fulfilment. This is not something that has happened overnight. On the contrary, you have been feeling the need to break away from a person or situation for some time now. It may have started off as a persistent, dull and flat feeling that progressed bit by bit into apathy and lethargy before falling further into depression and fatigue. Acknowledging first to yourself that you were no longer happy may have been hard to do, but vocalising it to others has now made it real. Sometimes we need to reach our lowest point before our inner-strength kicks in and supports us in what necessary and painful things must be done. When we reach that point, we either decide to stay down and surrender to our situation or pull ourselves out of it. The Eight of Cups reassure you that you can do it regardless of how difficult it may be, because deep down, you want this very badly. Now you must do what has to be done and put your own feelings first. If you are involved or caught up in a drama or negative situation, The Eight of Cups appearing can suggest that you withdraw or completely move away from it as the situation is hopeless. It is in your own interests to disentangle yourself emotionally and move to higher ground for it has been wearing you down on my levels. This Card often implies exhaustion and weariness but having to continue on regardless. You may feel you have no choice but what you really need is to get away for a while, just to heal and rest. The Eight of Cups is one of the cards that symbolically represents travel. The travel suggested my be overland or overseas. Where travel is concerned, this Card regularly appears for people who really need to get away before they fall over. Everyone needs a break at some stage and it is often those who need it the most that just can’t or won’t. Travel will be meaningful and may coincide with retreats, workshops, spas and places of peace, healing, restoration and rejuvenation. A vacation by the waterside; sea, lake or canal would be ideal with plenty of books to read. Travel may also symbolically represent exploring new areas and heading in new directions. When it comes to relationships the Eight of Cups does not bode well. It can suggest that the one you were first attracted to or loved has now been overshadowed by someone else, as symbolised by the Moon eclipsing the Sun. You now want to be with someone else and finding the courage to leave your current partner will be difficult. You will have to follow your heart and be true to yourself. You can no longer pretend. You will find the strength to do the right thing by all. Perhaps it is not you but your partner who has been drawn and attracted to another. It may be that his feelings have changed towards you with no third person involved at all. Regardless, the writing will have been on the wall for some time and your relationship will have felt different or changed recently. Communication and intimacy might have worn off over a period of time. Your partner is bound to have withdrawn from you emotionally. It is possible that you have been trying to ignore a niggling feeling in the hope that it will sort itself out. When the Eight of Cups appears, it generally represents a change of heart, losing heart and a loss of interest or feeling. It may not be possible to recover what has gone. Finding the emotional strength to acknowledge that your relationship is over is not easy, but do you really want someone who no longer loves you to stay, just to save you from the upset and upheaval of it all? This would destroy you on so many levels. Your personal happiness, self-esteem and self-worth would erode bit by bit and you would turn negative, bitter and sour. It will be a sad and traumatic time for you but there are other pathways to explore in life and things yet to discover about yourself. This period of your life is probably drawing to a close so let it go with dignity. On the other side, it can represent the slow realisation that you no longer love your partner. Making the ultimate painful decision to leave will require great depths of emotional strength. This is especially true when your partner has done nothing apparently wrong. It is easy to walk away from someone you hate and feel angry with, someone who has betrayed your trust or someone who has tried to destroy or abuse you. In fact, you will slam the door even louder on your way out. You may even break and throw a few things before you go and there might be a bit of scissor damage done to clothes and belongings. You will feel justified and vindicated. Not so easy to do is tell someone that you love them, but are no longer in love with them. Maybe, you don’t even like them anymore. Having to tell them that you are also leaving them can be heartbreaking. You watch the person that you once would have laid down your life for, crumple and fold before you. You are the bearer of bad news and you have brought such upset to another but it had to be said for you can no longer continue to live a lie. All you feel for them now is pity. Leaving this situation will likely alienate and isolate you from those around you. It may be a very lonely time when blame is dumped at your doorstep. 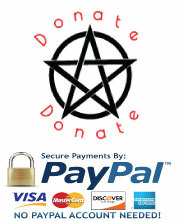 Those involved will not accept the change so readily. There might be anger towards you and people will call you selfish, but they do not understand. You cannot be responsible for other people’s happiness. You must do what is right for you. It will involve you leaving the stable situation of the Six of Cups with all its security, habits, routine and patterns to find the fulfilment you desire. The Eights being Cards of Strength indicate that you have the emotional courage it requires to walk away. The Eight of Cups is also strongly linked to abandonment or fear of it. This can cause serious problems in relationships. You may have a fear of being abandoned especially if you have a history of it from childhood or an early relationship. This can have a negative effect causing you to be needy, suspicious and fearful in relationships. You may not trust your partner or are too clingy. Your concern is that they may leave you. Your behaviour will make it more likely. Such issues generally need professional handling such as counselling or psychotherapy as they can destroy personal happiness and security. The death of a mother or father in early life can also be at the root of abandonment issues. The Eight of Cups can also may suggest actual abandonment such as a partner upping and walking away from a relationship leaving children and financial responsibilities behind. Look out for the Two of Cups in the Reading as this is another Card for sudden departure. Shyness, timidity and self-consciousness may be preventing you from forming a relationship. There may be someone you are interested in but you are giving off the wrong signals. Your shyness and silence may be misinterpreted as disinterest or rudeness. Likewise, the one you are drawn too may be painfully shy and too self-conscious to show their true feelings. You will need to make a gentle approach and be prepared to wait. Career wise, The Eight of Cups can suggest walking away from a un-fulfilling job or career. Let’s face it; you haven’t been happy there for a long time. Your heart is no longer in your work, and so you must go now and find that which will fulfil you. The Cups need a creative outlet and your job may suppress this side of your personality. Unrealised creative potential leads to deep unhappiness. You may need to explore other careers that allow you to develop or use your natural skills and talents. Perhaps the time has come for your to abandon the boring job of a lifetime and re-train. A career in the creative arts or craftwork may be immensely fulfilling. Time to bring out the potter, artist or writer in you. You may be taking a career break or have taken a temporary contract overseas. Physically and emotionally your work is draining you and you might just need a good holiday or vacation. You may be walking away from a business that is no longer viable or sustainable. However, you may just be gone on a search for new products, ideas, markets or clients for your business. You will need to look to the surrounding cards in the spread for confirmation on this as the overriding meaning for this Card is connected with walking away. When The Eight of Cups Reverses it can highlight a situation where you know that something is missing in your life yet you lack the strength and courage to do anything about it. You choose to stay and stagnate in an emotionally un-fulfilling situation fearing there is nothing else out there for you. You may have responsibilities; a partner, family, job, obligations, others relying on you. You may choose to put your own personal happiness way down the end of the list as no one else would understand. This denial of personal happiness or fulfillment over the happiness of others is often linked to poor self-esteem and lack of self-worth. There would also be concerns as to what others would say and how they would view your actions. You may feel trapped and restricted with no way out. Not enough thought is being given to your own needs, wants and desires. When we suppress our own happiness, dreams and needs it has a profound and long-term negative effect. We decide that we are not worthy of happiness and that happiness only happens to other people. We can be subconsciously resentful of those around us who put emphasis on their personal happiness and treat it as a number one priority. They follow their heart and fulfill their dreams while we stand by and watch. We may project our unhappiness onto them and call them ‘selfish’ and ‘only thinking of themself’ but deep down we wish it was us, wish that we had the courage and enough self-belief to live the life we want and not the one we have. Your deep unhappiness may leave you feeling weary, apathetic and fatigued. Pretending to be happy for the sake of others, takes up an enormous amount of energy and can rarely be sustained. Regardless of what is being displayed on the outside there will be tell-tale signs and giveaway clues, especially in our eyes which are the windows of the soul. Continuing on this theme, The Eight of Cups Reversed suggests that it would really be in your interests to take stock of your life. You may be aware on a deep level that you need to do some Soul Searching, but fear of what you might find or discover prevents you from taking that plunge. You may deliberately keep busy as a distraction from facing the truth of you and your situation. You may have a habit of just drifting along, day in day out, doing the same old things and not really asking much of yourself. It suggests that you do not really know who you are, what you want or where you are going. You may also have lost connection with your Spiritual Side and therefore have become too materialistic. There may be too much shopping, overspending, drinking and partying. You may cry out in protest that your lifestyle makes you happy but deep down there is a void which you are attempting to fill with frivolity and instant gratification. You may never spend enough time alone to discover who you really are because you are always on the go. On a more negative level, deep personal unhappiness can manifest through eating disorders, distorted body image and addictions. (this reminds me of a client of mine some years ago. I did Tarot Parties for her regularly. She had a lovely house and was constantly redecorating and buying beautiful things to put on shelves. It was like a centerfold from an Interior Design Magazine. She always looked amazing; fabulous clothes, trendy hairstyle and professionally tanned. When I would arrive at the house to do the party, much time would be spent admiring her house (each time), her clothes, hair, how much weight she had lost etc. I would then be shown to my room to set up for the Readings. I would hear all her friends arrive and go through the same oohing and ahhing that I did. They would all sit in the main living area where my client had food and wine waiting. While I was settling I, I would listen to the chat out of them. It was always the same, complimenting each other’s clothes, hair, jewellery and discussing where they had bought this and that and what they were getting next. Much conversation centred around my client’s house, the new chair she had bought or the choice of paint or wallpaper. I would marvel at the lack of actual conversation between the group. It was more like a mutual appreciation society rather than a few friends having a get together. They watched each other closely and it looked very competitive to me. One day my client rang and asked for a private appointment. This had never happened before as it was always the lighthearted parties. She came to see me, and for a moment upon opening the door, I didn’t recognise her. She looked very different. She was wearing a pair of jeans, a jumper, casual boots, no make-up and her hair was roughly drawn back off her face into a pony tail. When I asked her how she was, she blurted out immediately that she was very unhappy. She burst into tears and got very restless. I had to ask her to sit down about three times before she did. She told me she didn’t love her husband anymore and hadn’t for a long time. She said she couldn’t even bear him touching her. It was nothing that he had done; there was no other woman and he was a good father to the kids. She had just turned forty and had been married quite young. She said that she had changed, and now realised that she should not have married him. She admitted that she knew on her wedding day she should have felt more, but it was a big day and so much money and time had gone in to the preparations. She knew she couldn’t ruin it for everyone so went ahead hoping that it would all work out. It did for a while. There was much to do and all was new and novel. Then the kids came and that kept her busy. However, over time, she became lethargic and disinterested. She said he bored her and listening to him talk about his day in the office was enough to put her to sleep. She started to eat dinner separately with the kids to avoid sitting down at the table with him. She now dreaded family holidays and dinner’s out for she felt she had nothing to say to him anymore. Looking back, she admitted they had very little in common when they got married. They had just drifted from a mediocre relationship into marriage because a lot of their friends were getting married at that time. She said it just seemed like the thing to do. I asked her if her husband had any idea of how she felt or had she spoken to him of her feelings? She hadn’t because she was afraid of what would happen once it was out in the open. However, she believed he knew and likewise preferred not to ask. Instead, he threw money at her when she seemed particularly unhappy. She agreed that this always lifted her out of the doldrums for a while. She would throw herself into doing up the house or going on shopping sprees and for that period of time, she would be happy, lighthearted and enthusiastic. The thing is, it never lasted for long. When the high wore off, she would hit a low and feel miserable all over again. Thinking she was suffering from depression, the doctor put her on some mild antidepressants but all they did was make her drowsy, so she stopped taking them. Instead of trying to get to the heart of the matter, she would think of something else she could do to keep her mind away from her pitiful reality. She would arrange weekends away with her friends, big parties for the children and even the garden landscaped. Tarot Parties and pampering evenings were part of this forced entertainment. I asked her why she had chosen to come to me now, asked if something had happened? She told me that nothing really terrible had happened. She had woken up early two days ago and had lain awake staring at her husband for some time. She had willed herself to feel something but it wouldn’t come. She then got up and went into her bathroom where she sat in front of the mirror staring at her reflection. This is what had upset her the most. She said that she didn’t recognise the woman staring back at her with no make-up and bed head hair. She realised that she hadn’t looked at herself, really looked at herself maybe ever. She examined her face closely and noticed the fine lines around her eyes and mouth and this upset her. She looked into her eyes and tried to find something there that she could call ‘her’ but said there was an emptiness that disturbed her. In the above story, my client acknowledges that something is wrong, that something is missing and now wants to do something about it but The Eight of Cups Reversed can also suggest that you are deliberately choosing to ignore it. It may not be in your interests to bring it to anyone’s attention as the unhappiness may not be on your part. Highlighting the issue may bring unhappiness to you. This can happen in any situation but is quite common in relationships. In the above story, my client’s husband obviously knew that she was not happy, but instead of asking her to sit down and talk to him, he proceeded to duck and dive in order to avoid the truth. He loved her and still wanted her as his wife. His feelings for her had not changed. He had loved her more than she had loved him on their wedding day. He wanted things to stay as they were so he did all he could to avoid the upheaval, change and unhappiness it might bring to him. His solution to keeping her happy was to shower her with money and gifts thereby buying himself more time. Who can blame him for not wanting to lose the woman he loved and his marriage, but what of her happiness? Regardless of how long they were married, he did not really know his wife. How long would he be able to sustain this effort? How long before his own self-esteem and morale hit the floor, knowing that the woman he was married to no longer loved him. Would her presence in his life be enough for him, without her love too? What does he expect of her in the long run, that she should just go on pretending indefinitely, so that his world and the world of his children would not be upset? These are very hard questions to answer and as discussed in the Card Imagery Section, it takes a lot of emotional strength and courage to face up to the fact that your partner no longer loves you. The Eight of Cups Reversed challenges you. It asks you to do the right thing even though it will break your heart. In a relationship there will be no real happiness unless both partners are happy. It just won’t work any other way. When the Eight of Cups Reversed applies to you in this manner you will need to call on all your inner-strength to support you through this terribly difficult time. If the situation is not reversible, if your partner no longer loves you or wants you, then let them go with as much dignity as you can muster. Acknowledge that this current cycle of your life is over and you should both be free to move in new directions. The Eight of Cups Reversed in a Relationship Reading may highlight commitment issues. Fear of commitment in relationships may have you upping and running off as soon as it begins to develop or becomes more intimate. Maybe you lack the courage or emotional strength to say that it is over preferring to just disappear or leave unannounced. You might choose to end a relationship by text or email rather than face to face. You may also have a habit of drifting from one relationship to another without giving much thought to compatibility or suitability, knowing in advance that you can easily leave if it is not to your liking. The Eight of Cups Reversed can be sign of lack of emotional maturity and not being able to deal with difficulties when your relationship hits a rough spot. On the other hand it can be a sign that you are clinging stupidly to a relationship that has long died. When the Eight of Cups Reverses, we now see the Eight Cups at the top of the picture. They are all upside down and instead of the Figure walking away from them they now seem to follow him. These Reversed Cups are unable to contain their Watery contents, which are happy emotions and joy. Empty and cold, they are a considerable weight. They represent his emotional baggage that follows him wherever he goes. In the Upright he has spent time analysing his life, dealing with negativity and that which is not of any value or worth to him, but in the Reverse, he ignores this. He thinks that by going away or relocating to foreign shores or new territory he will find the happiness he seeks. He does not see them of course but his empty Cups, his Emotional Baggage are his constant travel companions and will taint his life wherever he goes. If there has been a bereavement, then the Eight of Cups Reversed can suggest that you are finding it very difficult to move on after your loss. There is a huge void in your life and it has made you terribly unhappy. You may be visiting the grave too often or spending too much time dwelling on the dead rather than living. In your grief you may believe that you have buried you happiness, dreams, hope and life along with the one you lost. Look to other Cards in the Spread to highlight this sad scenario. You must go back to the Seven of Cups and take a long hard look at your life. There is much more for you to do and your journey far from complete. This Card can also tell of the harsh cold reality of being abandoned. Abandonment may be as a child; a father or mother leaving home or dying or even being left in a basket on the church steps. Look to surrounding Cards for Reversed Court Cards. Your partner or spouse may suddenly abandon you, leaving you to fend for yourself with children to feed and bills to pay. When The Eight of Cups Reverses, abandonment issues may be at the root of unhappiness in your relationship. You may be sabotaging your own happiness by worrying and fretting over your partner leaving you. You might be clingy and needy or try to love too much. Rather than keeping your partner close, it will leave them feeling very claustrophobic. When they leave you because of it, it only serves to perpetuate the belief that you always end up abandoned, that no one loves you, that no one ever wants to commit to you. You may be the instigator of your own woes. On the other hand you may go about sabotaging your happiness in an another manner. With deep down abandonment issues you may constantly try to pre-empt your partner’s potential departure by getting there before them. You may confuse or misread petty arguments or disagreements as a sign that they are just about to dump you so you dump them first. You might think you are being clever and beating them at their own game but they may be oblivious to the mind games going on behind the scene. 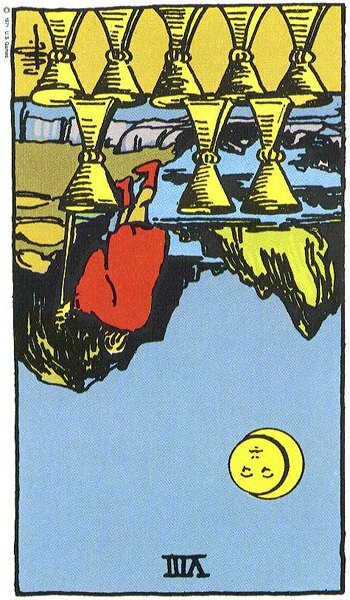 Separation and Divorce can be represented by both the Upright and Reversed Eight of Cups. Usually in the Upright, the partner who leaves, handles it in the correct manner and is doing it for the right reasons. In the Reverse the manner in which the Separation or Divorce is handled can be insensitive and emotionally cold. However, on a lighter note, and depending on surrounding Cards, the Eight of Cups Reversed can highlight the return of an estranged partner or spouse and reunion after separation. Apologies and forgiveness thaw any animosities and a relationship can begin to recover with a new sense of purpose and understanding. It can also suggest that you are refusing to move on with your life after Separation or Divorce in the naive belief that your partner will return to you. You need to go back to The Seven of Cups and discover your own identity. Maybe you want to leave or run from a difficult situation rather than face up to the issues it exposes. You can have a pattern of running away whenever anything gets too difficult or awkward. Returning to the Seven Cups, you may be chasing a dream that will never materialise. It may amount to nothing but a ‘wild goose chase’ following ‘castles in the sky’ or ‘seeking a pot of gold at the end of the rainbow’ You may forsake something of real worth as a result but fail to listen to good advise or heed any warnings. You should take a reality check and turn back before you make a huge mistake. The Shyness and Timidity of the Upright Eight turns into forwardness and boldness when it Reverses. Instead of being self-conscious there is now a risk of making a show of yourself in public. Where Travel is concerned, The Eight of Cups Reversed can represent the return home after much travel. On the other hand, travel may have to be postponed. There may be delays and changes to your itinerary. You may need a vacation or break badly but it is either denied you or you refuse the opportunity for escape. You may be fearful of travel preferring to stay put or you could have a transient nature and never stay too long in any one place. The stacked Cups can also represent someone who collects things but in the Reverse it may seem more like stockpiling. Never seeming to have enough, he will always find place for his latest find. Like children who collect and stack pebbles and shells at the beach, the Figure walking away could be gone in search of more items for his collection. Where Careers are concerned, the Eight of Cups can suggest choosing to stay in a un-fulfilling job or career as you fear change or new things. You may long for a break and to get away, but work is too busy and demanding. However, you may prefer to be enslaved by your job and pass up on any opportunity to take a holiday. When was the last time you had a break? The Eight of Cups can suggest that you are not doing the work you should be. You have not explored other career options or even given any thought to what might be most suitable for you. You are settling for your lot instead of happiness and personal fulfillment. You are possibly wonderfully creative and artistic but these talents get parked and ignored while you pursue a career or work in an industry where they have no relevance. There is so much more that you could be doing. Then again, the Reversed Eight of Cups can highlight the return to an old career or making a business out of an old hobby or pastime. Perhaps you have a pattern of drifting from job to job, moving on when things get boring or difficult. You may be travelling the world, finding work here and there to fund your expenses. Then again you may have taken a break from work to travel the world and the Reversed Eight suggests that the time to return has arrived. In Business, you may be clinging on to a business that is no longer working. You might find it all a bit draining. Your business has not brought you the happiness it once did but you struggle on relentlessly. Then again, there may be some vital component missing in your business but you fail to investigate at the price of success and profit. It may be advisable to take a break or spend some time revisiting the Seven of Cups to identify your business needs. Then again, you may just walk away from your business, leaving debts and staff unpaid. Like the Upright, the Eight of Cups may also represent the entrepreneur or business man searching for ideas and products for his business. It is time to return to the preceding The Seven of Cups to understand the lessons contained therein. A time to take stock of your life and identify any areas where you do not feel fulfilled. Then you can set about making the necessary changes.